This best-selling book covers everything a fisherman needs to know about casting. In addition to highly detailed information about methods and tackle, every key step is illustrated with movie clips. Starting with simple exercises that make your tackle and body work properly, you’ll master the key steps in making long and relaxed casts from the beach. From a set of preliminary exercises, build your own version of the highly effective Easy Cast style. That may be all you ever need. To go farther into casting technique and to raise your game even higher, I’ll show you how to graduate to the fishing pendulum style. 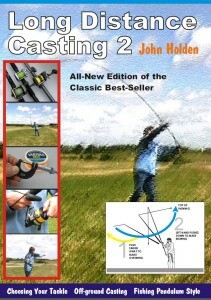 This is a book about practical casting using methods developed over many years. The foundations of good casting will never change regardless of whatever method happens to be flavour of the month. Without these basic skills any fisherman will always struggle to cast well. This is not a book about tournament casting. The emphasis is strictly on the beach. On the other hand, we don’t settle for second rate results. The average fisherman prepared to do a reasonable amount of practice can expect to fish at 130 metres or more using ordinary rods and reels. Both the Easy Cast and the fishing pendulum are actually capable of more than 200 metres. The big-swing version of the pendulum style is fully capable of topping 250 metres. It is the style that held many past tournament records. Please be aware that the video clips in the book WILL NOT PLAY on most tablets, smartphones, Kindles, etc. You need a Windows PC or laptop, Mac computer or Linux machine, preferably with Adobe Acrobat Reader installed. Before ordering, please be aware that delivery may take up to 24hr. A download link will be sent to the email address associated with your PayPal account. More details at the bottom of this page. This popular book explains all about popular casting multiplier reels such as the Daiwa, Abu and Penn. 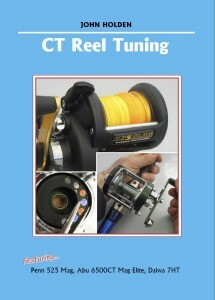 Since nearly all small reels are based on the same basic design, the book applies to most CT reels on the market. Like Long Distance Casting, this book concentrates on practical beach fishing. Tournament tuning and advanced customising are not included simply because they don’t apply to everyday beach work. We focus on what’s important for fishing – setting up, lubrication and commonsense tuning. The outcome is a docile and predictable reel that nevertheless casts exceeding well. Most of these small CT reels will cast more than 200 metres straight from the box provided they are used properly. CT Reel Tuning shows you exactly how to do that. European Union VAT legislation has made it impossible to download these books directly from this website. This VAT rule is causing massive problems for publishers, and we’re fighting to have it amended. To get over this, you will receive an email with a secure link for downloading the book’s PDF. The message will usually arrive in your mail box within 24hr of placing the PayPal order. Click on the link, or copy and paste it into your web browser. In the rare event of non-delivery, please let me know through this website’s Contact page. Most problems are caused by the buyer’s PayPal email address not being up to date. Is your PayPal email address current and working? If not, please let us know an email address where we can send your download link. I have been improving my angler skill regarding surf casting following your tips, so I am very glad that you are around sharing your experience with us and making our fishing event even better.